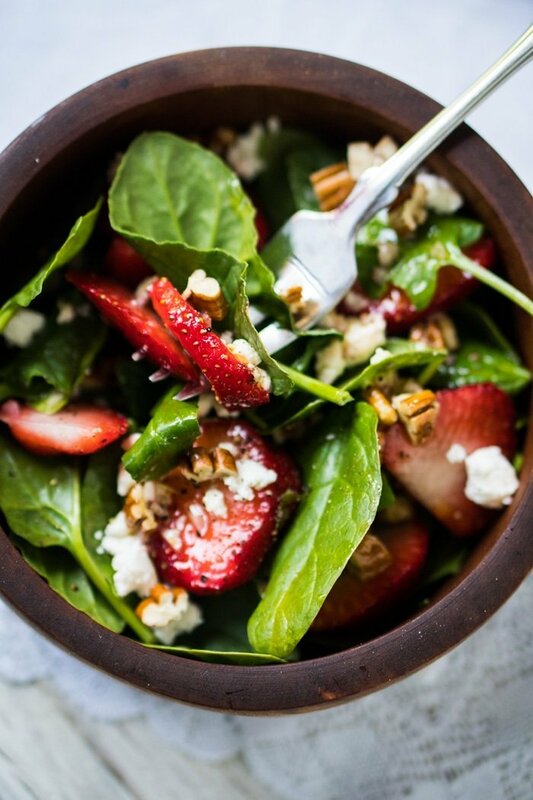 This paleo and keto strawberry spinach salad is incredibly fresh, nutritious, simple and scrumptious! Whip it up in under 15 minutes for a stellar low carb side dish. 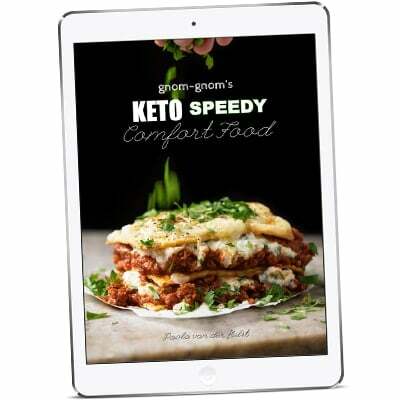 Ideal for summer barbecues, picnics and fresh lunches (or dinners!). Just always be sure to add the dressing right before serving, keeping the spinach nice and crisp. Trust me, this is one salad that will keep you coming back for more. The nice and nifty thing about this keto salad is that it is easily customizable. And without losing any greatness, that is. 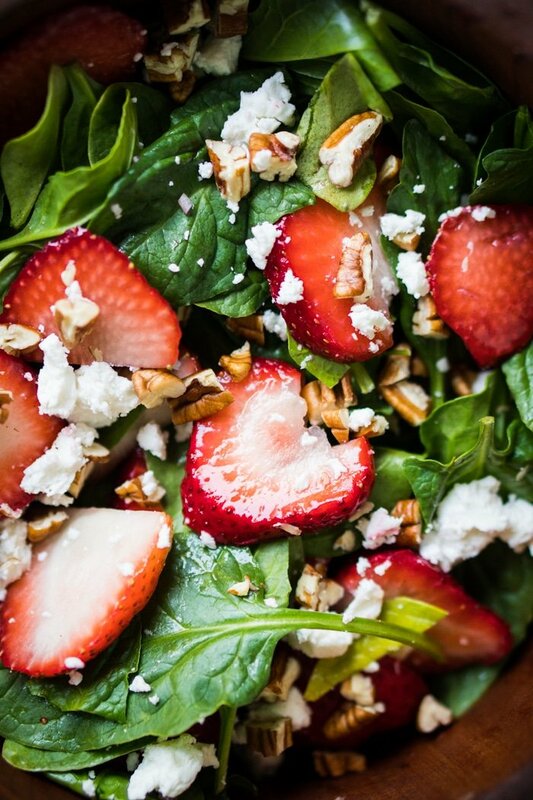 The base are strawberries and spinach. The remaining bits and bobs can be customized to the heart’s desires. 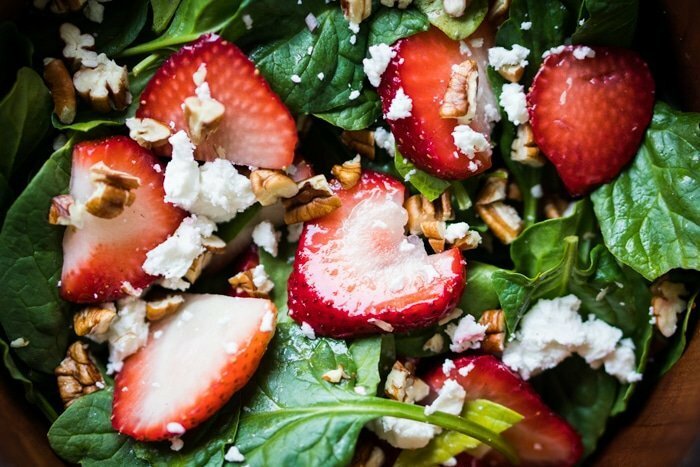 You can add basil leaves for extra freshness, cheese (think goat’s or feta) for added creaminess, toasted pecans or walnuts for some crunch… You’ve got options! As per salads in general, try to keep your ingredients top-notch. They really are the make-it or break-it elements of raw dishes. Oh and for dressings in general, I’ve really enjoyed using Lakanto ‘maple’ syrup in place of honey (or maple syrup). It works nicely with olive oil and vinegar to add a touch of sweetness to certain salads. Combine all the ingredients for the dressing in a small bowl. Set aside. 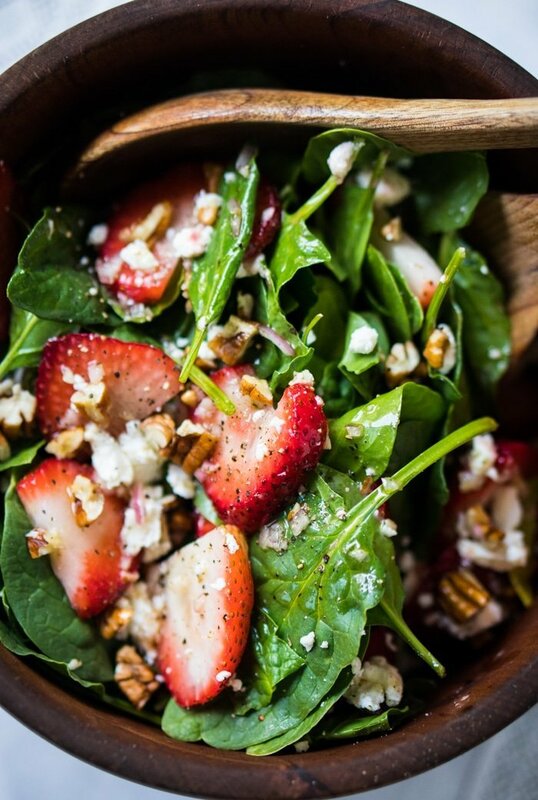 Toss together in a salad or mixing bowl the baby spinach, strawberries, pecans and goat cheese (optional). Top with the dressing right before serving. 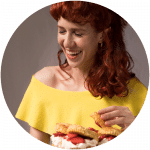 Please note that you can lower carbs significantly by reducing the amount of strawberries (they can go a long way after all). Though I must say that I like the added nutritional benefits of said berries, so I don't mind digging in (within reason!). 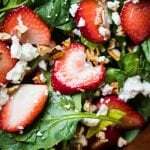 This salad looks amazing, but I’m wondering how is it keto with maple syrup? Isn’t that full of sugar? Thank u.
Hi Monica! It’s a maple syrup sub xo! Jen that’s so awesome to hear! It’s my absolute pleasure 🙂 And lucky you to be getting warm temperatures!! The weather turned on us this week here in Mexico City and it’s been raining and cold… boohoo! Hope you enjoy this one too! xo! So I’m not one to leave comments, but I had to for this one. You were totally right that this is such an amazing this!! I made it on a whim as a side for dinner last night and it ended up being the star (wish I would have known, I would have doubled it!). Could I use dried basil instead? This looks SO beautiful!! Insert heart emojis!! !